If you’re looking for a fantastic side dish to showcase all the harvest vegetables of the fall season, look no further. 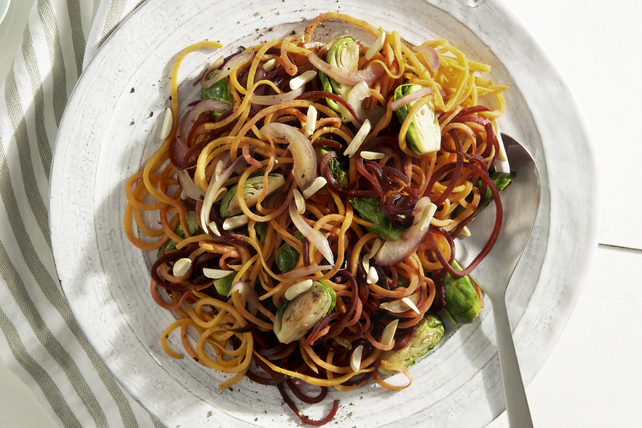 Beets, sweet potatoes and Brussels sprouts share the spotlight in this simple Roasted Spiralized Vegetable Medley side dish. You can either spiralize your own veggies, or look for pre-spiralized root vegetables in the produce aisle of your supermarket. Toss sweet potato noodles with Brussels sprouts and half the dressing; spread onto one end of parchment-covered rimmed baking sheet. Repeat with beet noodles, onions and remaining dressing; spread onto other side of prepared baking sheet. Bake 35 min. or until vegetables are tender. Spoon noodle mixtures into serving dish; mix lightly. Sprinkle with nuts. Cook nuts in skillet on medium heat until golden brown, stirring frequently. If you have a vegetable spiralizer, you can use that to cut 2 peeled fresh beets and 1 peeled sweet potato into spirals. As a bonus, this colourful side dish is high in fibre and an excellent source of vitamins A and C.